There are two species in the genus Bubalornis, although they have been considered as one species in the past. Both species are dark plumaged with females being duller, and the species differ in bill colour, as indicated by their names: White-billed and Red-billed Buffalo-Weaver. The Red-billed is found in southern and East Africa, and the White-billed in West Africa - there is a small zone of overlap in East Africa. They are found in savanna, thornveld and dry woodland. Buffalo-Weavers are unique among weavers (and most birds) in that they have a solid phalloid organ on the belly in front of the cloaca. The organ is larger in males than females (see photo here) - the function of this organ during their prolonged copulation is not entirely certain. Buffalo-Weavers do not normally associate with buffalo but by a twist of chance, Andrew Smith (who first described the Red-billed Buffalo-Weaver) first saw this species associating with buffalo in North West Province (read more here). 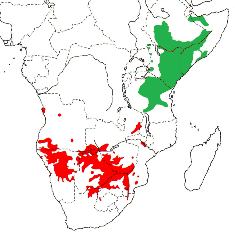 The Red-billed Buffalo-Weaver Bubalornis niger is divided into two subspecies, the nominate in southern Africa (red on the map above), and B. niger intermedius in East Africa (green). There have probably not been any major range changes for this species in historical times, but it is probably more common where it can choose man-made nest sites within its range. It feeds mainly on insects, particularly grasshoppers and caterpillars, but also takes seeds and fruit. This species is usually polygynous, with one male and several females occupying a nest. Sometimes two males form a coalition to defend a group of nests and both will help feed the chicks in the different chambers. The male usually builds the nest, collecting twigs up to 1 km away. The nest is an untidy mass of thorny twigs, with several nest chambers inside as illustrated in the photo (left) of a sign board at the Skukuza nursery In Kruger NP. Nests are built on large trees, often baobabs. Nests are also built on man-made structures, including windmills and electricity pylons. One particularly unusual site that has not been documented in the literature is a radio mast - see photo (right) from phown 2495. The female incubates the eggs. 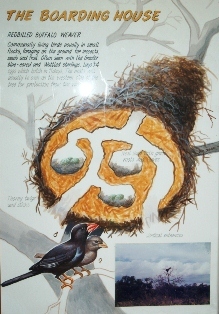 Nests may be infested with mites and other invertebrates. Raptors sometimes nest on top of buffalo-weaver nests and a variety of smaller birds, especially Red-headed Finches, may take over a nest chamber, eg. phown 196. If you find nest associations, please submit a record to PHOWN with appropriate notes. The number of nest chambers cannot be counted easily and for this species PHOWN aims to collect breeding distribution data, nest site information, and longevity of nest sites by recording annual repeats, rather than colony sizes. Of particular interest are nests built on power structures, as these may cause flash-overs and power outages. Julia Amukwa is a student studying this problem, and will use the PHOWN database to supplement her data - please submit any records of weavers nesting on power structures to help her! See a summary of PHOWN records and breeding information for the Red-billed Buffalo-Weaver here.